I’m sure this is the how to blog you’ve been waiting for a veterinarian to write. I take my job as a veterinarian very seriously. But I do drink a little. I’ve brewed beer a number of times and really enjoy the process and of course, the results. But I’ve got three daughters under five, I work at least 50 hours a week, I am on call 24/7 for 7 days out of every 14 and brewing beer takes some time commitments I just don’t have. But still, good booze is expensive and budgeting is important. I wanted to find a way to stay solid on flavor but also keep more of my hard earned money in my bank account. I think I’ve come across a winner here. Update on May, 24 2015. I recently learned that this is not an original idea (I sort of figured someone would’ve thought of this before it’s so easy) here’s an article with much more colorful language and writing than my own. The basic premise is simple. I took yeast, added it to fruit juice, let it ferment in an oxygen free environment and then enjoyed the bounty of nature’s labor. Here’s a step by step. Step one: You’ll need some decent reusable containers. You don’t want to have to get new containers every time. You also need a collar that fits snugly over the top of the bottle and a vapor lock to keep oxygen out. 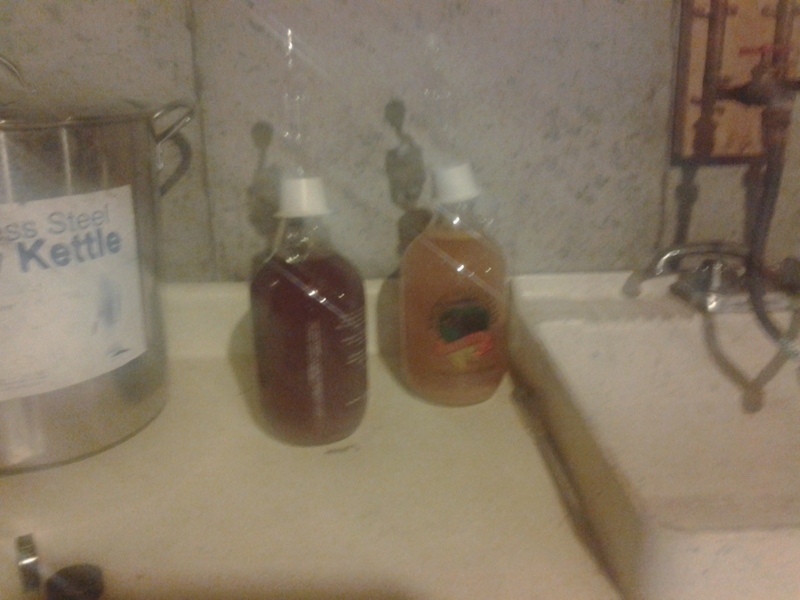 We’re making booze not vinegar. 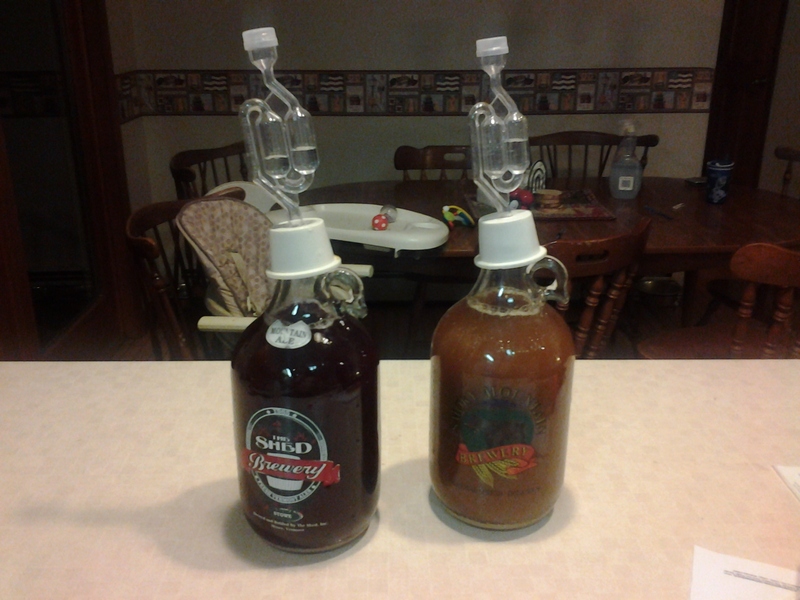 I had these half gallon growlers lying around and picked up the vapor lock and collar from a home brewing store for less than 5 bucks. They are also reusable. Step Two: Next you’ll need a substrate (juice) and some yeast to turn the sugar in the juice into alcohol. I used apple cider from an orchard here in Vermont and I picked up a blueberry pomegranate juice that had no added sugar and no preservatives. I was going for fancy. The yeast was a gamble. The first time I tried this, I used Champagne yeast. It worked nicely but yielded a fairly low alcohol content. 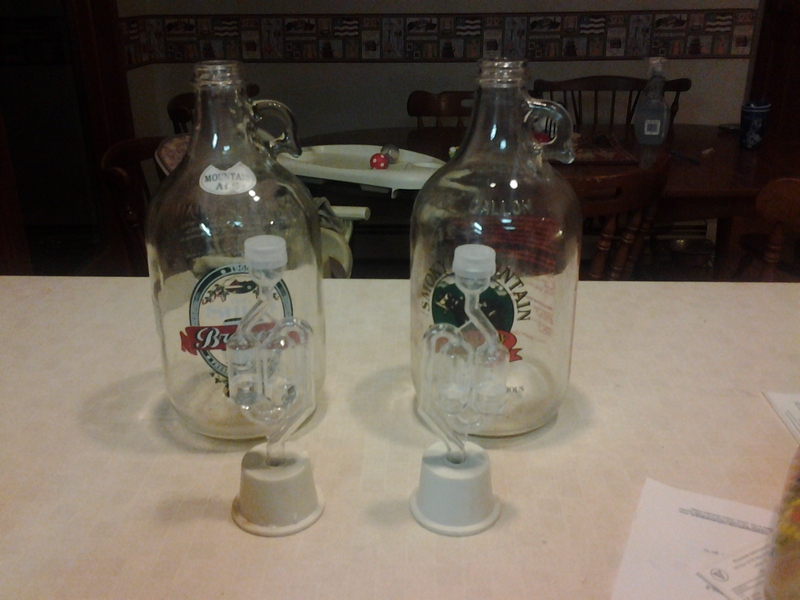 Not that I’m greedy but half a gallon yields a little better than 5 beers. If I brew a gallon that gives me just under a 12 pack. If I have to wait an entire week and get less than 2 beers per day before the next batch is done, I want them strong. So for this batch I used a super yeast. It will survive up to 20% alcohol by volume but there isn’t enough natural sugar in juice to get that much alcohol. Also, I don’t need that much. You can order super yeast from amazon. 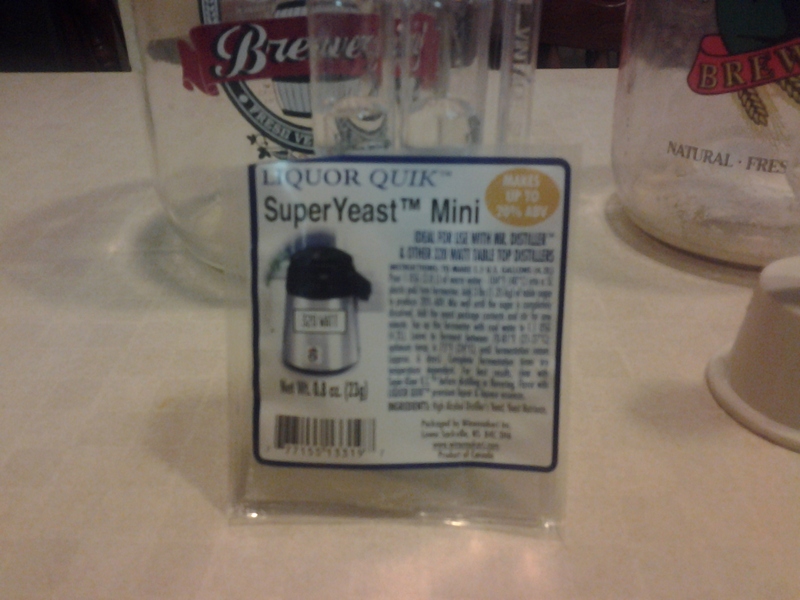 Here is a close up of the yeast I used. Step Three: The next logical step is to add the yeast and the juice to the containers and secure the collar and vapor lock. To activate the vapor lock, you just fill with water to between the lines that say minimum and maximum. The end result of this step looks like this. Step 4: Leave it alone for at least a week. If you leave it too long, the yeast dies and when they die they sort of throw up their guts and give your beverage that mealy textured cardboard flavor. The beverage is full of B vitamins when that happens so it’s not bad for you but we’re not making health food here. I left mine in the basement. Step Five: After a week. 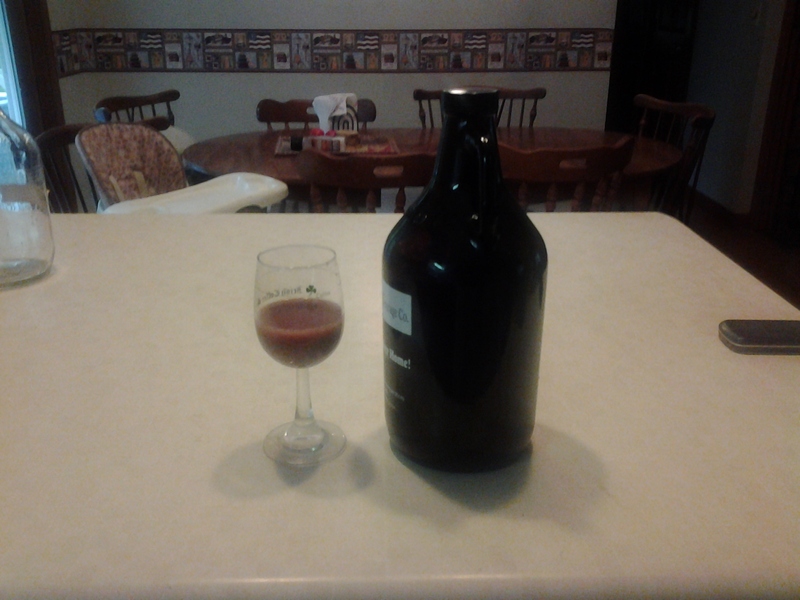 I moved the now fermented beverage into a secondary growler (I have a few of these things) and put that in the fridge. After a few hours it was ready to drink. The blueberry pomegranate came out really good. 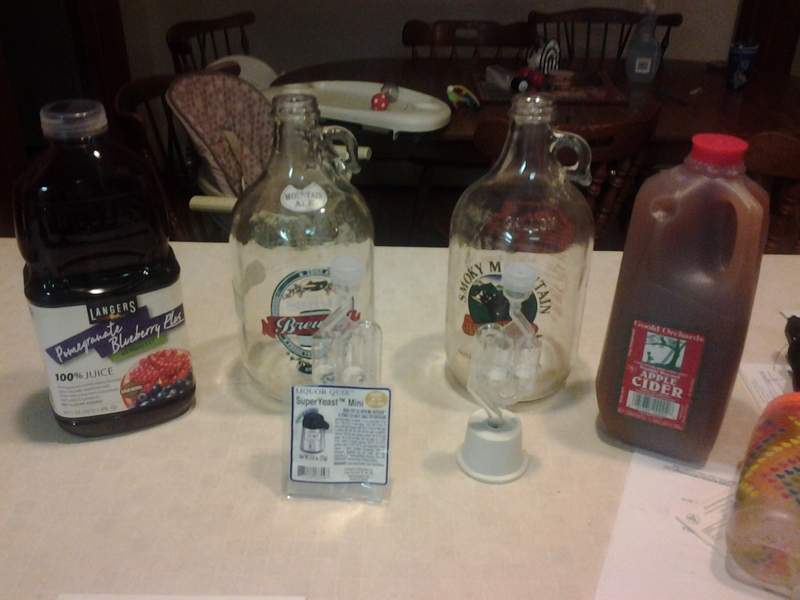 The cider was as expected but the blueberry pomegranate was unexpectedly delicious. So there you go, in five easy steps you can make your own homemade hooch. ← I don’t HAVE a body. I AM a body.